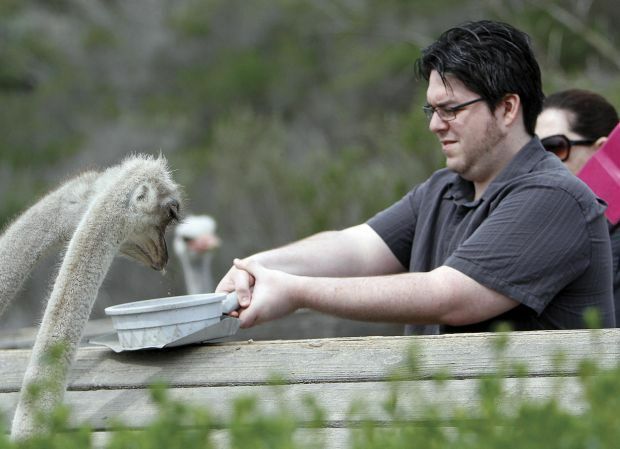 Steve Walker feeds some ostriches at Ostrich Land along Highway 246 in the Santa Ynez Valley. 80 ostriches and 20 emus. 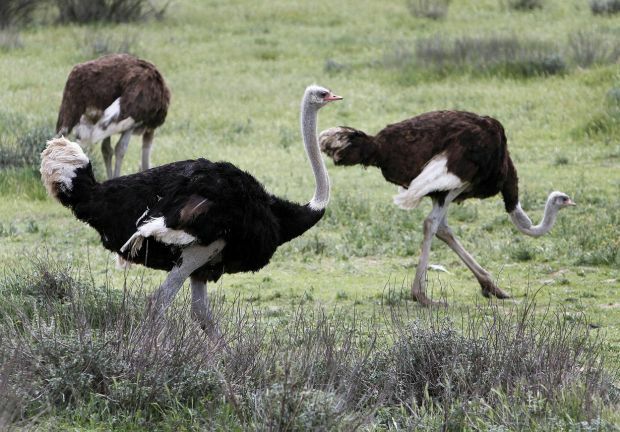 So it's something of a surprise to see dozens of ostriches racing around a 33-acre spring-green spread along the Santa Ynez River. The tourist attraction on Highway 246, a mile east of Buellton, offers an opportunity to go eyeball to tennis-ball-size eyeball with one of nature's strangest, most magnificent birds. We held tightly to the handle of the metal dust pan that held a bowl of granular ostrich pellets to feed these truly big birds. Rules are strictly defined on a board at the entrance to the ostrich viewing area. Hey, we didn’t want to get pecked. The unique black-bodied birds are separated from viewers by a high fence, though they eyed us curiously as we approached. ostriches — or maybe they were emus, their tawny, slightly smaller kin — who pecked every last pellet from the bowl in minutes. We left with smiles on our faces. So did everyone else. Brown explained ostriches may grow to 9 to 10 feet tall, weighing 250 to 350 pounds. Natives of Africa, they're mostly vegetarians but they may eat a few bugs, she said. The nonflying birds can run at speeds up to 45 mph. And no, they don't bury their heads in the sand. Ostrich Land is open daily 10 a.m. to dark. Admission is $4 for adults, $1 for children. A bowl of food costs $1 extra. Roadside Attractions is a weekly chronicle of sights along the Central Coast’s highways and byways. Sally Cappon can be reached at sjcappon@aol.com.